What is an 8 Puzzle? An 8 puzzle is a simple game consisting of a 3 x 3 grid (containing 9 squares). One of the squares is empty. 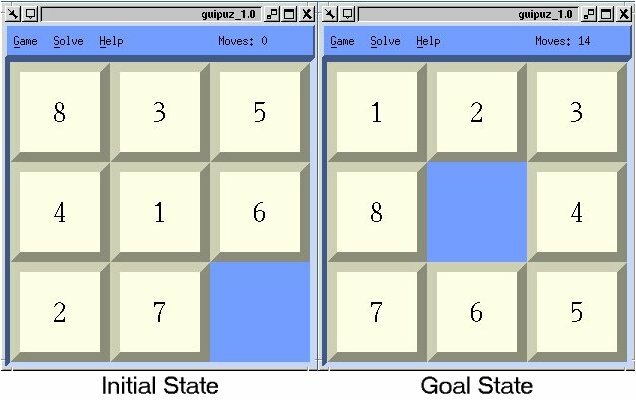 The object is to move to squares around into different positions and having the numbers displayed in the "goal state". The image to the left can be thought of as an unsolved initial state of the "3 x 3" 8 puzzle. What is an 8 Puzzle Program? The 8 puzzle program was written as a 2-person project for Dr. Tim Colburn's Software Development course (CS2511) by Brian Spranger and Josh Richard. The assignment was to write a program that is intelligent enough to solve the 8-puzzle game in any configuration, in the least number of moves. We were also to provide a Graphical User Interface (GUI) to the user to make the program easier to use. The Intelligent engine was written in C++ and the GUI was written in Motif/X11 converted from standard C to use encapsulated Object Orientated Design Constructs. The image below shows the finished program with a random start state and correct goal state displayed. 1. Guess through every possible state by doing a blind search of the state space. 2. Implement a search operation that is guaranteed to find the shortest solution using "informed methods" (How?). Informed methods help us gain information about solving a problem through its current state space. This keeps a program from blundering around blindly guessing. Informed search strategies make use of information about the path of moves we took to get where we are currently by using an "evaluation function". In our solution design, we coded an expansion routine that takes the current state of the game and expands it to the next possible moves for any given state. If you use your imagination, the shape of the expanded nodes looks like an upside down tree. Each level of the tree is called "depth"
(fig a): The numbers next to the game states represent the number of tiles out of place for the given game state. 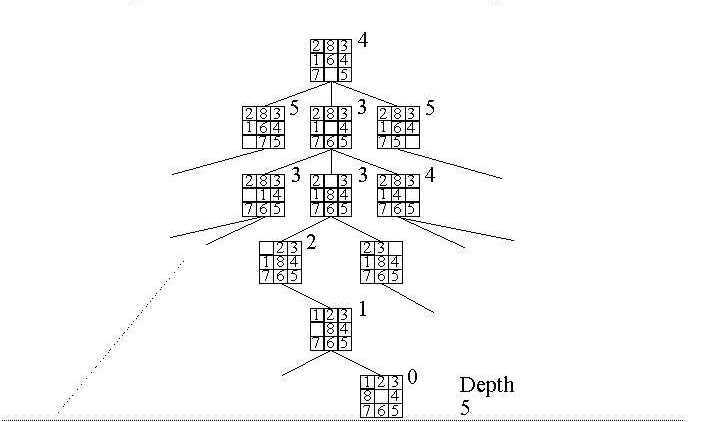 The lines represent the search depth of the tree. The solving algorithm (heuristic) to set up move ordering intelligence uses these values to become more"informed". 3  = 3.4 x 10 = 3.4 Billion game states. Thus a good heuristic is necessary in order to reduce the number of game states that are evaulated. Notice that the goal state can be achieved in 3-6 in this example. If you recall we want to solve this in the least number of moves so we can achieve a higher sense of accomplishment. This will also allow us to solve more complicated puzzles. How do we make this more efficient? The answer to the question posed is to refine the approach used to determine the next move. If we think about fig. b again, we can see that winning state occurs in two (or more) places in the game tree (states 22, and 28). We can order these moves with the help of a special queue that orders based on priority. The priority is determined by taking the current heuristic value and adding it to the depth. This gives us our A* (a star) value for a particular state. If the queue is ordered properly (lowest first), the next best move is always "next in line" for expansion. This process will always yield the correct solution in the least number of moves, as long as the puzzle is initially a solvable state. 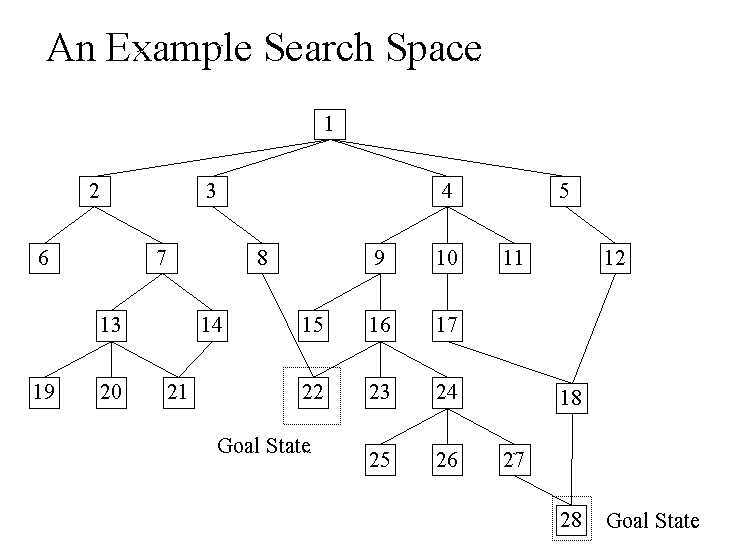 The A* searching algorithm is a recursive algorithm that continuously calls itself until a winning state is found. When the game is designed, in order to randomly generate different games, start with the goal state and make many random moves on the state. made on a particular state are valid. the move on the state and continue looping. This way, you can be sure to have a game state that can be solved This will keep you from having an algorithm that gets lost in its own thoughts and never evaluates to true (infinite recursion).